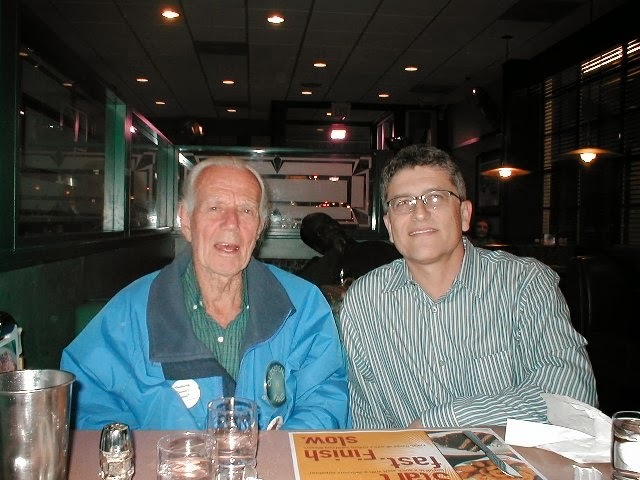 I was sad to learn of the passing of John Dobson on January 15, 2014. He was 98. Dobson, a former monk and self-taught stargazer who developed a powerful, inexpensive telescope bearing his name, showed thousands how to build their own telescope during five decades as one of amateur astronomy's most influential evangelists. I had the distinct honor of meeting Dobson in person on several occasions, once during a mirror grinding session up at the Griffith Observatory in Los Angeles. I can't remember anyone with more enthusiasm and commitment to public outreach for science. But my most memorable experience with Dobson was the time I took him to dinner while he was passing through LA. He chose the restaurant: Denny's and as attribute to his secret of longevity, when the waitress asked "What will you have sir?" he simply replied "Bring me something green." Here's a cherished picture taken with Dobson at Denny's. Dobson will be missed. His spirit for understanding the wonders of the universe will live on in the form of his popular invention, the Dobsonian Telescope. RIP. Lately on some Sundays, my L.A. Times newspaper has included an intriguing new insert called “The Red Bulletin: A Beyond the Ordinary Magazine.” Aside from interesting articles on extreme sports, travel, arts and music there is a particular regular column that always catches my eye: Winning Formula. The article always features a large picture of some sporting activity: free throw shot in basketball, skateboard kickflip, high-wire acrobat on a bicycle, freeclimbing, weightlifting, etc. The inset image is from the Winning Formula June 11, 2012 column featuring the physics of Tim Lincecum’s pitch ( the ace pitcher from the San Francisco Giants). What I like most about these articles is how they graphically superimpose Newtonian mechanics formulae over the photo to demonstrate the physics involved. Then in the text of the article, the equations and principles are discussed. I’m pretty sure the demographic of this publication is something like Males (18-30) – just a guess – so having math and physics appearing on a regular basis is absolutely delightful. Who knows, it may be enough to convince more than a few young people that science is no longer nerdy if it can be applied directly to something they can readily identify with. Thanks Red Bulletin for educating us! Here’s a tip: you may wish to avoid the Starbucks on Tapo Canyon Rd. in Simi Valley, Calif. Why? Because it’s filled with intelligent design zealots. Here’s how I found out about this. Last week I found myself over there using the free WiFi with my laptop to do some research on data science. I was having a pretty good time, lucky enough to find a private table near a power outlet. I was going pretty well when an older gentleman (sort of professorial with a twist) and a much younger man sat nearby. Privacy is not a luxury I often find working in Starbucks, so I couldn’t help overhearing their conversation – about the Lord. Oh golly-gosh I grimaced, where was this going? After much banter I hear the younger man ask the older one “May I ask when you started your relationship with the Lord?” This resulted in a very long-winded history lesson starting with the Korean War. The part that made me want to run for the hills was when the older man (“preacher” was the twist I had noticed earlier) began a discourse on irreducible complexity. But the topic that irked me the most was when the preacher-man brought up irreducible complexity – the hackneyed example being the human eye – certainly it was way too complex to have evolved without the help of a designer. It immediately made me think of Michael J. Behe’s book “Darwin’s Black Box” that first presented this point of view for the intelligent designers. 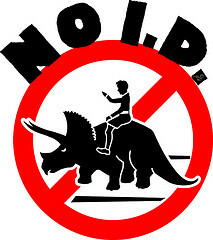 Of course, I also recall the MANY articles by scientists that clearly, and poignantly showed how ID is a bunch of bunk – articles in Scientific American, Nature, Science, just to name a few. Again, if only the righteous right would sit down and read a book carrying the majority’s scientific view, or take a class in modern biology, they actually may understand the error of their ways. But then religion is all about ignoring scientific fact in favor of voodoo and magic. After a while of this, the older man and the younger man began recognizing many others also at the Starbucks, each quietly pouring over books and laptops. It wasn’t until then that I noticed the “books” were all Bibles and other religious works. It appears much of the Starbucks crowd was studying for the ministry, missionary work and other pious activities. Wow, I’m used to tolerating Starbucks filled with budding screenwriters, but never have I encountered a Western-style Madrassa. So if you’re of a science mind, you might consider a Starbucks far from Simi Valley. I know of one nearby Caltech where people actually read math books!